Ice at Bluewater? Well, not really. It was “ICE” – In Case of Emergency. 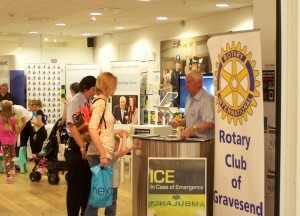 The Rotary Club of Gravesend was out again over the last days of the school holidays promoting ICE in Bluewater at The Safety Shop run by the Kent Constabulary. Rotarians like Bob Denby were at the shop talking to people about adding ICE (In Case of Emergency) contact numbers on their mobile phones or on special cards that can be kept in purses, wallets or even childrens school bags. If you want to learn more about ICE, go to our article on ICE.